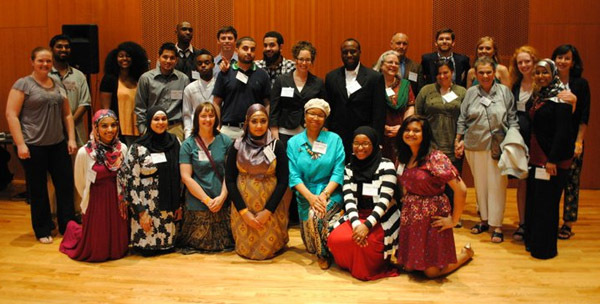 On June 16th, in Millennium Park, One Chicago, One Nation (OCON) celebrated the success of Community Ambassadors (CAs) who have worked in collaboration with Inner-City Muslim Action Network (IMAN) and Interfaith Youth Core (IFYC), since the beginning of the year. The OCON initiative started in 2010 as a partnership between One Nation, Chicago Community Trust (CCT), IMAN, IFYC, and Link TV. Since the start of 2011, this year’s cohort of interfaith leaders has sought to mobilize faith communities in Chicago to come together for the common good. The gala began in Millennium Park’s Choral Room with delicious hors d’oeuvres and mingling. The room was filled with the laughs and chatter of CAs and alumni from Year One. Also in attendance were One Nation staff, representatives from CCT, City of Chicago officials, and staff of IMAN and IFYC. Later, the evening’s program commenced with opening remarks by OCON program managers’ Saleem Muhammad and Rochelle Rickoff who were the evening’s emcees. CCT’s Terry Mazany was the first speaker to the podium. Mr. Mazany highlighted the two-year OCON initiative and discussed CCT’s support of the program. Although, Community Ambassadors were collectively honored for their accomplishments, Mr. Mazany also had the pleasure of recognizing those CA’s that received Social Entrepreneurship funds (SEFs). The crowd was gleeful as SEF grantees Kinza Khan, Tom LaClair, and Kayla Higgins each stepped to the podium to describe their anticipated interfaith projects. Nevertheless, the energy in the room reached its real peak as Executive Director Eboo Patel of IFYC addressed the crowd followed by IMAN’s Executive Director Rami Nashashibi. Their words of inspiration and interfaith solidarity were reflective of the diversity of the faith traditions present. The evening closed with final remarks by Saleem and Rochelle who invited guest to VIP seating at the Pritzker Pavilion in Millennium Park to watch performances by Egypt’s Hakim and Azerbaijan’s Alim Qasimov Ensemble. The performances were part of the Chicago Department of Cultural Affairs and Special Events’ “Music Without Borders” concert series, which offered an excellent culmination to OCON’s interfaith reception. This entry was posted in Arts & Culture, One Chicago One Nation, Organizing & Advocacy by Saleem Muhammad. Bookmark the permalink.